Ameera Rahim is the Productive Muslimah behind Traditional Muslimah Homemaker and Habeebee Homeschooling. Traditional Muslimah Homemaker encourages women to enjoy taking part in their household duties, while Habeebee Homeschooling documents the homeschooling journey and provides a supportive network for those that want to educate their children at home. In this interview, Amanda Mouttaki speaks to mother-of-five Ameera Rahim, and explores how a Productive Muslimah can efficiently prepare the home for Ramadan so that she can make the most out of the blessed month, in Sha Allah. Asalaam alaykum, you’re joining Amanda for the “Ramadan Revealed” webinar series. This week our topic is the home and I have a very special guest on the line with me; Ameera Rahim. The first question I wanted to talk about is preparing the home for Ramadan, so what are some easy ways we can stay organized In sha Allah, and maybe touch on a little bit about why it’s even more important to be organized during Ramadan? I feel as though organization and schedules help maintain focus and keep Ramadan special. A special Ramadan schedule can help us take advantage of the day. Take an example from our Creator, Allah . He governs the creation with balance and order and so we should strive to have order and balance with in our homes. So Sha’ban and Ramadan are the perfect times to do that. Prophet Muhammad fasted most days during Sha’ban in preparation for Ramadan. Just as a marathon runner doesn’t run the race without preparing beforehand – they spend time training – we should do the same for Ramadan. It’s a blessing to attend things like this webinar to prepare our heart beforehand. There are Ramadan tools that can help you get in that direction. I just ordered from a friend of mine a Ramadan Battle Plan from Halalify. Masha Allah I find tools like that help me keep my Ramadan organized. There are others you can use with your children. The Hearts of Light website has a planner for children and it’s great that sisters take the time to make these tools available so that we can get the most from the month by setting goals and planning how to spend our fasting days. Those are great points. I honestly schedule everything anyway, that’s just how I am. The other thing, which sounds counter intuitive really, during the first few Ramadans I said I’m just going to push through this. That didn’t turn out well, because I ended up exhausted and didn’t feel like I got much out of it spiritually because I was so busy being busy. Subhan Allah, I’m glad you mentioned not overdoing it especially if you’re pregnant or breast feeding and fasting. You definitely don’t want to overdo it and be too strenuous. Another thing I like to do is to cook at night or earlier in the morning so I know I won’t be very exhausted. During the day I might not feel up to it. Easy light meals you can make in advance are great. I wish I would have known things like that from the beginning. When I started fasting I was just going about my days normally. Then I was skipping suhoor, which I don’t recommend for anyone. Don’t skip that. An important part of taking care of your home and family is taking care of you. That meal is very important. When I did miss suhoor I was out of it for the whole day. By the time 12 noon came I was ready to go to sleep until it was time for iftar. Make sure you wake up in the morning and eat suhoor. Protein shakes were helpful, and make sure to drink plenty of water to keep your energy going so you can take care of your home and yourself. What are some things that we can do ahead of time to prepare our homes? Part of preparing your home is to give it a good clean. Welcome Ramadan with a clean home. Decorate! I read a hadith that said, “Cleanliness is half of faith” [Sahih Muslim]. So to let us light up our homes by keeping them tidy and encouraging our family to do so. Ramadan is a time for purification, so we should purify ourselves and our homes. Masha Allah, I like to say, “Clutter our hearts and de-clutter our homes”. You don’t want to start with chaos. You’re training yourself to keep it ongoing. The whole point is not to start during Ramadan and then go back to your old habits when it’s done. You want to continue this the whole year. The idea of decorating is really interesting and I’ve not done that, but the older my kids get, the more interested they become and they want to get into it. Any advice? We women and mothers are the heart of the home. We bring life to it. We can make it an enjoyable experience just by the way we care for it and the way we decorate it. You’ll be amazed that it will affect everyone else in the home because they’ll be excited. In order for our homes to function and be in order, we need to function and be in order. The atmosphere of our home will help. Fasting and patience are closely related. We’re striving to live in harmony. The attitudes we have in our home affect everyone else. It’s amazing how women in homes can affect everyone. If we’re in a bad mood it throws everything off. We should reflect on attitude, intent and character as we enter Ramadan. Do you relax more during Ramadan with household duties or homeschooling, or do you use the month to work even harder and get more reward for your hard work? Right now, I usually back off so that the children are doing more arts and crafts and Islamic studies during Ramadan. Personally, with household duties, I like to really get the heavy duty things done after fasting. I don’t do much during the day, besides working with the children. But you also want to stay on schedule, because it’s so easy to get off schedule this month. Things are so different. Be consistent for you and your children or you’ll be thrown off. During Ramadan, I host people a lot more. Or we have community potluck iftars. I think that’s expected to some degree. How do you advise other sisters to manage this? Prepare things early. It always makes things easier! This does not just mean in the kitchen, but also getting clothes set out at night. A good idea is to welcome your neighbors and have family over for iftar. The rewards for feeding fasting people are so great Masha Allah. As the hadith says, “The Prophet was the most generous of people and he used to become more generous in Ramadan when Gabriel met him” [Sahih Al-Bukhari]. So really make an effort. It’s a good way to bond with others and increase love between people. If you can host people, Masha Allah, it’s something that should be encouraged. Any final thoughts or insights on preparing your home and family for Ramadan? Before Ramadan starts, you definitely want to have a journal and set some goals of what you want to accomplish, and what you want your family to accomplish. Do you want to spend your time during Ramadan reflecting, and spending time with Allah ? Where do you want to see yourself, spiritually, by the end of Ramadan? Do you have a problem with patience? Do you need to learn more surah or dua? Sit down to write down your goals and take the time to learn it. Focus on becoming a better person, and make your household better. This way, you’ll have your priorities in order before Ramadan starts. Things can get hectic when Ramadan starts, and you can feel overwhelmed. But by setting your goals early, they will act as reminders that can really renew you and your faith. Also, consider just journaling through the month. Then In sha Allah, next year you can look back and learn and grow from them. Thank you so much for joining us Ameera, your wisdom and encouragement is wonderful as always and I really appreciate you taking the time to be with me. is the publisher of MarocMama, a website about food, travel, and living as a bi-cultural family. Amanda reverted to Islam eight years ago and recently began the Ramadan Revealed series on her website after noticing a growing number of women who; recently converted to Islam, were married to Muslim men, or were living in Muslim countries, and lacked a resource to provide relevant information and answers to their questions about Ramadan. She is married to a Moroccan man whom she met in fairy-tale fashion on the streets of Marrakech, and together they are raising two boys. Amanda also holds an MBA and works as a social media professional. 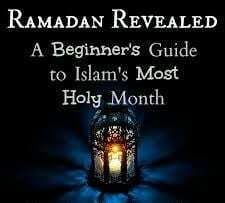 To listen to Amanda’s full interview with Ameera Rahim, visit Amanda’s “Ramadan Revealed: A Beginner’s Guide to Islam’s Most Holy Month” webinar series, where you can also gain access to all other interviews featured in the series.